artSMart: WHEN IN DOUBT, SAY DARLING! WHEN IN DOUBT, SAY DARLING! 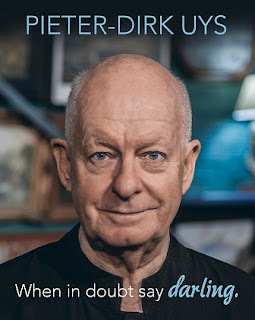 Booking is now open for a new entertainment with Pieter-Dirk Uys ....and other darlings titled When in Doubt, Say Darling! After a sold-out season at Pieter Toerien's Montecasino Studio and the Fugard Theatre in Cape Town, the newest Pieter-Dirk Uys show – When in Doubt, Say Darling - will have two seasons in KZN: at the Hexagon Theatre in Pietermaritzburg on October 30 and 31 and again on November 6 and 7, and at the Elizabeth Sneddon Theatre on Durban’s UKZN Campus, on November 1,2,3,4 and again from November 8 to 11, 2018. Sometimes politics repeats itself, not only taking history and turning it into farce, but taking farce and turning into the fake news which is now called entertainment. Pieter-Dirk Uys is sorting out 40 years of distress, disguise and disgust: from apartheid to tripartite, from amandla to Nkandla - and happily back to amandla. In the boxes are wigs, glasses, wagging fingers, toyi-toyis, red berets, trump cards of madness, icons and aikonas, from Bezuidenhouts, Raubenheimers and Ramaphosas to Altzheimers. See PW Botha impersonate Jacob Zuma! Witness Dr Piet Koornhof solve the Brexit stand-off! Celebrate the appearances of Angela Merkel, Theresa May, Nowell Fine and Evita Bezuidenhout! Booking through Computicket for Durban and Webtickets for Pietermaritzburg.